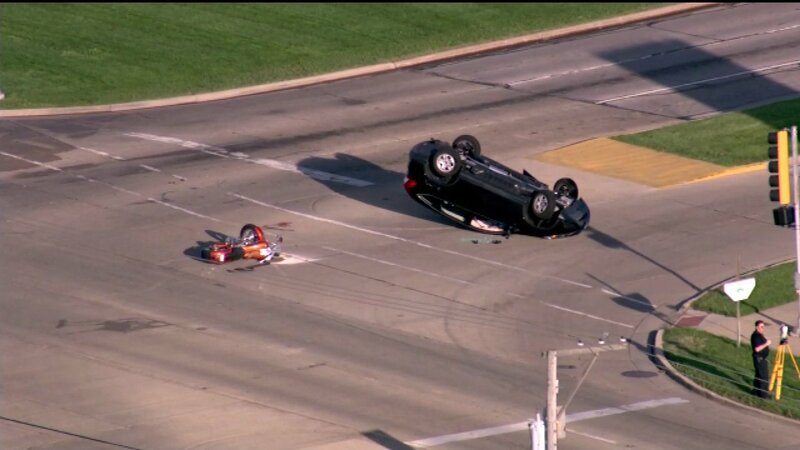 AURORA, Ill. (WLS) -- A motorcycle driver was critically injured Tuesday morning in a crash in southwest suburban Aurora. A 57-year-old woman from Naperville heading east on Ogden Avenue was in the middle of making a left turn onto South Commons Drive around 5:40 a.m. when police said her 2016 Honda CRV struck a 2014 custom-built motorcycle heading west on Ogden. Police said the force of the impact caused the motorcyclist, a 55-year-old man from Yorkville, was thrown from his bike and the CRV flipped onto its roof. Police said the motorcycle did not have operating headlights the man was not wearing a helmet. He was transported to a hospital in Aurora and later airlifted to another suburban hospital, where he is listed in critical condition. The woman was extricated from the CRV, but declined medical treatment, police said. She was the only person in the vehicle. She was cited for failure to yield while turning left. Police said there were no signs that drugs or alcohol were involved in the crash. The intersection of Ogden and Commons was closed for about four hours during the crash investigation.